Blackboard Learn (BB) is a learning management system, which enables its users to easily exchange information, course material and notifications. It is a web based program that can be accessed from any computer connected to the College’s network. 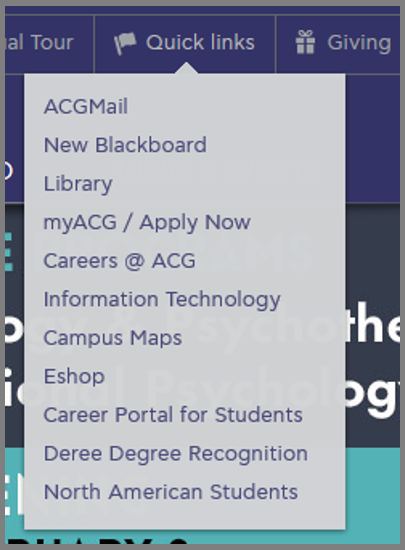 Type blackboard.acg.edu in the web browser or access the College’s Web-site (acg.edu) and via the Quick Links button choose New Blackboard. Create a Service Request on the IRM HelpDesk. Call Bb Support at +30 210 6009800 ext. 1382. Call Bb Administration at +30 210 6009800 ext. 1378.